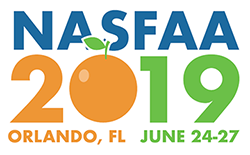 NASFAA is pleased to have staff from the U.S. Department of Education (ED) join us in Orlando. Below is a listing of the sessions offered as well as "Ask a Fed" information. The "Ask a Fed" table will allow attendees to discuss Title IV-related questions, such as policy guidance, administrative procedures, and operational requirements, with an experienced ED staff member. This session will address various issues that arise when administering federal student aid for transfer students. Discussions will cover transfer monitoring and demonstrate how to correctly award and disburse both Federal Pell Grants and Direct Loans in standard term credit-hour, clock-hour, and non-term credit-hour programs. Additionally, ED staff will provide example scenarios about what to do when a transfer student withdraws during overlapping payment periods for Federal Pell Grants and Direct Loans. This session will address the activities a financial aid administrator must perform when a student adds or drops courses as well as when a student withdraws (excluding R2T4 calculation). Discussion and case scenarios will be provided concerning recalculation rules and census dates in various situations as students add and drop courses. This session will also provide an in-depth explanation concerning student withdrawals on such topics as school attendance, official and unofficial withdrawals, determining the date of withdrawal, and reporting deadlines. This session will address common Subsidized Usage Limit Applies (SULA) misunderstandings and misreporting. Presenters will begin with an overview of concepts and the requirements of the 150% limit. ED staff will delve into how reporting mistakes and some processing shortcuts can impact a borrower's subsidized loan eligibility or result in a loss of subsidy. Included will be guidance on how to configure a loan when remaining subsidized eligibility is less than 1.0 year. The goal is clean SULA processing and no longer needing a prior award year re-opened to make necessary corrections. This session, ideal for Financial Aid Administrators (FAAs) and Information Technology (IT) managers, will begin by providing a brief overview of federal IT security initiatives that impact postsecondary institutions (PSI). This session will identify best practices for data protection and identity theft, define what constitutes a breach, discuss common and not so common examples of breaches, describe how to report a breach to FSA, and the steps FSA will take to work with a PSI once a breach is reported. This session will close with a question and answer period by FSA experts in cybersecurity. ED staff will discuss modules in relation to Pell Recalculation and Return of Title IV Funds. This session should assume basic understanding and focus on the complexities that modules can bring to the administration of Title IV funds. Senior officials from the ED will present information and updates about ED's Title IV activities and initiatives, including information about ED's regulatory efforts. ED staff will discuss the flexibilities and restrictions when handling Title IV funds. In this session presenters will discuss various aspects of properly disbursing Title IV funds including Title IV credit balances, early and late disbursements, post-withdrawal disbursements, and retroactive disbursements. In addition, presenters will review G5 drawdowns, G5 and COD interactions, and timely and accurate system reporting. Presenters will also provide information regarding how to disburse or return funds if improper payments occur or if a student regains eligibility. ED staff will explain how different types of academic calendars affect the administration of student aid. This session will also explain the differences between standard term, non-standard term, and non-term with regard to both Pell formulas and Direct Loans. ED staff will discuss changes planned for the 2020-21 FAFSA including the My Student Aid app and provide information on volume and any mid-year enhancements. In this session, ED presenters will review verification requirements for the 2020-21 award year.